Rural communities in Arizona are being harmed as checkboards of federal land are creating roadblocks and preventing growth. The Cottonwood Land Exchange Act is common-sense legislation that will benefit local communities and families in Cornville by allowing for expansion of Windmill Park. Washington, D.C. - Today, U.S. Representative Paul A. Gosar, D.D.S. 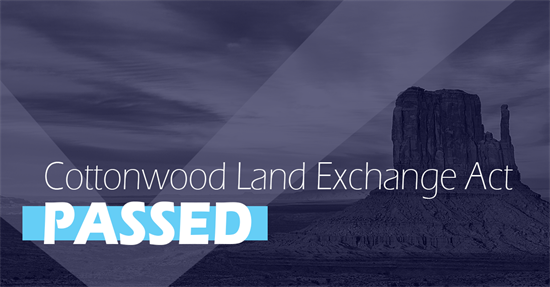 (AZ-04) and Yavapai County Supervisor Randy Garrison released the following statements after HR 6146, the Cottonwood Land Exchange Act passed the House of Representatives by unanimous consent. The bill would require the U.S. Forest Service to exchange, at the request of Yavapai County, 80 acres of federal lands in the Coconino National Forest for 369 acres of lands owned by the county. The result is a usable additional 80 acres for Yavapai County versus the currently unusable 369 acres, giving Cornville a much larger and more functional park. Yavapai County Supervisor Randy Garrison said, "This is a great step forward for our communities. Putting public land back into the hands of our local citizens will provide generations of enjoyment of these great resources which include a rich riparian corridor, ancient archeological sites while providing a direct access to our State wide trail system and further protects our endangered Arizona Cliff Rose. I want to personally thank Congressman Gosar and the entire Arizona Congressional Delegation on providing the leadership and support to move this Decades long process to completion. Our Citizens are extremely thankful for the hard work and dedication to see this day through." The text of H.R. 6146 can be found HERE. A map of this land exchange can be found HERE. Cosponsors of H.R. 6146 include: U.S. Representatives Debbie Lesko (AZ-08), Kyrsten Sinema (AZ-09), David Schweikert (AZ-06), Ruben Gallego (AZ-07), Tom O’Halleran (AZ-01). Yavapai County officials have been in discussions with the Forest Service for several years and passed a resolution in favor of advancing this mutually beneficial exchange. The isolated lot of National Forest land is an 80 acre island parcel not contiguous or adjacent to any other Forest or state land. It is surrounded completely by private or county land which is mostly residential in nature. The 369 acres which the Coconino National Forest would receive from the County will add value to the Forest Service system by connecting separated tracts and consolidating land already under the stewardship of the Forest Service. The County has stated that it would like to maintain the land as a park and for other public use in order to better serve the residents of the County, City of Cottonwood and the community of Cornville. Specifically, the County has expressed that it would like to maximize use of Windmill Park and make it easier for visitors to access by making significant improvements that include adding a walking bridge, adding a new trail and expanding the park. As clearly outlined in the bill, the County has agreed to pay for the required land surveys, appraisals, and any other costs necessary to complete the exchange. The Congressional Budget Office estimates that the lands acquired by the Forest Service under H.R. 6146 will generate revenues for the agency.